I never go anywhere without these wipes! While washing your face is certainly the best thing you can do, it’s sometimes difficult to do a tiny airplane bathroom. 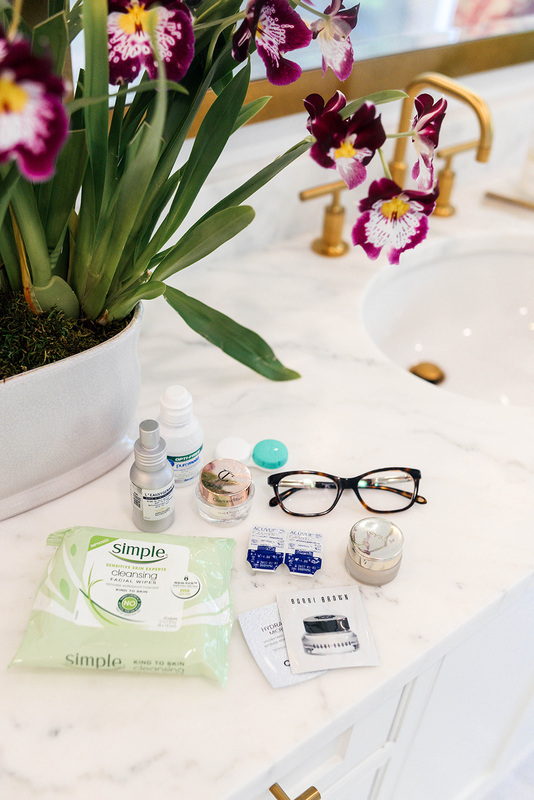 These wipes make it easy to remove all of your makeup before the rest of your in-flight skincare regimen, or freshen up before you land. I love them! They’re a great drugstore buy too. One item I’ve been using when needing to tone and hydrate in a pinch is this mist. It restores your pH levels so your skin can fully absorb the rest of the products you put on your face. It also is just a nice refreshing spray for the flight! Whenever I travel, I always bring a bunch of skincare product samples! 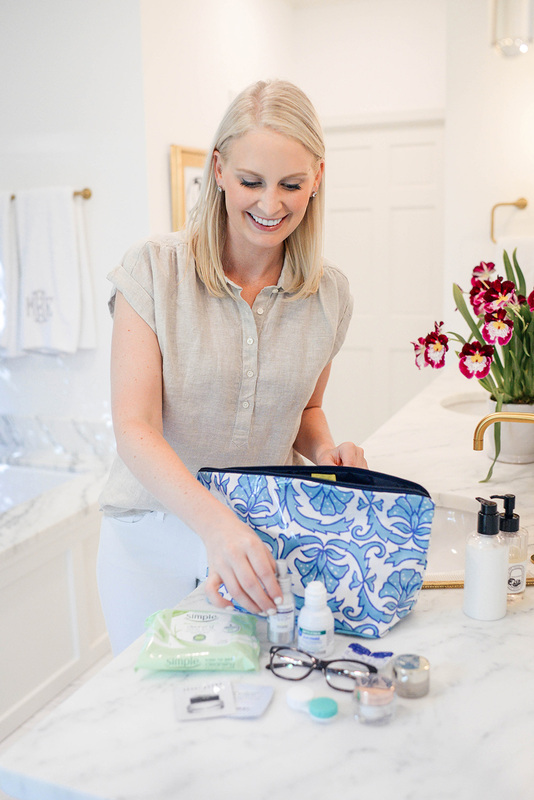 Thanks to beauty purchases on Nordstrom, Sephora and Neiman Marcus, I’ve acquired dozens of toners, serums, eye creams, moisturizers and more that are perfect for packing in my carry-on and toiletry bag for long flights and trips! They’re lightweight and easy to pack in pretty much any kind of pouch or case (they’re so thin you could fit them in the side pocket of your purse!). It’s also a great way to test out new products! I usually reserve my Charlotte Tilbury Magic Cream for the colder months of the year, but I also always travel with it. My skin is very dry year-round, but it gets even more parched on long flights! The Magic Cream is a super dense moisturizer that I really feel soaks deep into my dry pores and protects my skin throughout the flight. Such a good staple to have on hand when traveling! In the same vein as the above, my lips also get really dry on flights. I also tend to fall asleep with my mouth open when I’m sitting up on a plane (so bad and embarrassing, I’m aware), which tends to make them even more chapped by the time we land! This Baume de Rose is a thick lip balm I cover my lips in right before I go to sleep. It keeps my lips soft and supple all flight long! Finally, I can’t go on a flight without my contact case, glasses and contact solution. Not necessarily a skincare must-have, but your eyes can get SO dry on planes and it is important to give them a break. Also not pictured: my toothbrush and toothpaste. Don’t get on an international flight without them!! A good inflight skincare makes the biggest difference! There are great product options! I definitely agree with you on a refreshing facial mist and lip balm. Airplanes can really dry out one’s skin because of the high altitude and limited oxygen. Thus, it’s so important to keep both your skin and lips hydrated so they’re not about to crack off once getting off the plane. Another thing that’s super important, and yes it’s said quite enough, but for some reason I feel that people think differently when they’re on planes, but it is to take your makeup off before you go to sleep!